Stratford Homes Fullerton | Excelsior Homes West, Inc. If you are looking for a two story home with four bedrooms, the Stratford Homes Fullerton may be the perfect home for you! The Stratford Homes Fullerton is a four bedroom, two and a half bathroom home. With 2792 square feet of living space, this home has plenty of space for any growing family. The main floor of this floor plan includes a separate dining room and flex room just off the front entry. The back of the home includes the main living space, with a spacious kitchen, breakfast nook, and living room. All the bedrooms are located on the second level of this Stratford home. Each bedroom has large closets, with the master suite having two walk-in closets. The second story also includes the utility room with washer and dryer hookups and a utility sink. You won’t be carrying large loads of laundry up and down any stairs in this home! Excelsior Homes West, Inc. can deliver modular homes throughout Minnesota and surrounding states! Contact us today for pricing! 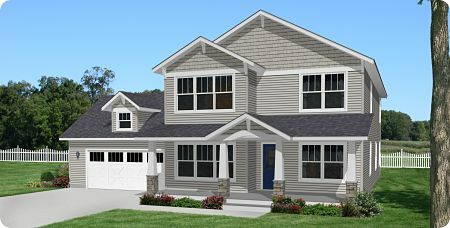 The Stratford Homes Fullerton can be customized with available options and upgrades. The Stratford Homes Fullerton can be personalized with a number of material options and upgrades. Make this house feel like home by deciding the colors and finishes and by adding personal touches throughout. This home also has the option of adding a fireplace in the living room. What a great way of making this home feel more cozy and warm! If this home interests you, call us today!